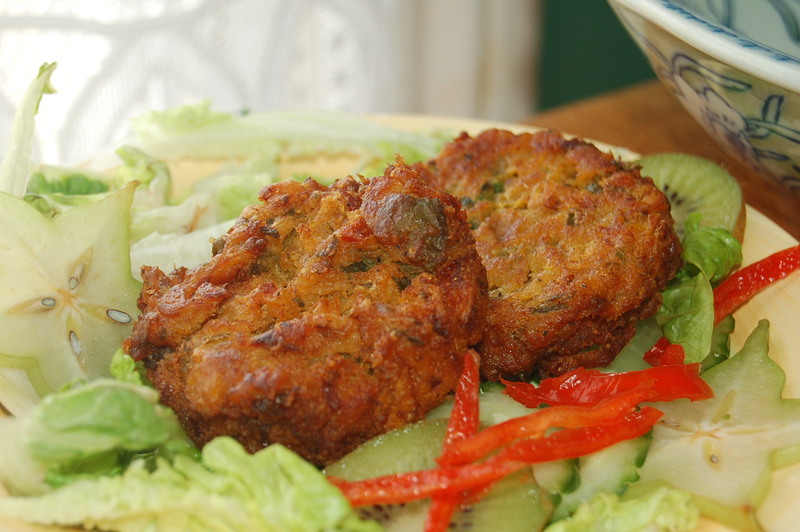 Karimah’s Jamaican Salt Fish Fritters. You had better try these tasty snacks now before Ramadhan .These tasty snacks are not ideal when you are fasting because they are so salty but they are so delicious I just had to include them, they are memories of my Rasta days. You can season them according to you own taste and serve alone, with salad or as part of tapas or mezze. 2. Boil again in fresh clean water to remove even more salt. 3. Break the salt fish with your fingers to take out large and small bones. Dice, shred finely, and set aside.Make sure you patiently and attentively take out all the bones. 4. Chop and combine onions, garlic, spring onion and scotch bonnet pepper. 6. Place the codfish in a mixing bowl . 7. Add the fried seasonings and paprika and add flour and cold water to make a thick batter. 8. add a little more oil in the oil heated skillet and Spoon the batter into the pan to make 3″/ 8cm patty burger shapes. 10. Drain on paper towels and keep in a dish in a warm oven until ready to serve. Traditionally served with hardoe bread, a white doughy bread in case you swallow a bone the bread will help take it down, however on a health tip hardoe bread is not great so make sure you say”bismilliar” and carefully remove ALL bones.